- Collaborate with Macau organization to promote the importance and advantage of continuous log monitoring and analysis. 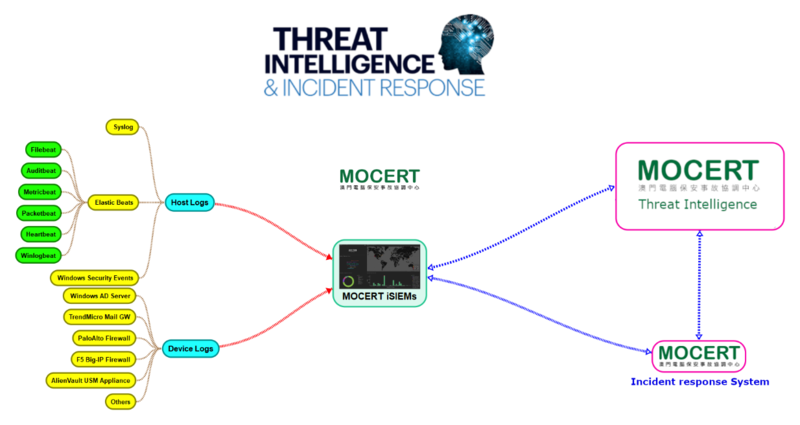 - Provide the continuous log monitoring solution and advance log analytic service to strengthen enterprises’ IT security against the various threats and attacks. - Hardware resource sizing (server and storage). - Converged log processing mechanism (collection, normalization, searching and reporting). - Distributed log processing nodes to ensure the data integrity and service availability. √ Security engineering, configuration and advisory on different security facilities for the emerging threat identified. MOCERT can provide professional hardware sizing according to the requirement of estimated daily log size of client’s infrastructure. The procurement process of requested hardware is assumed to handle by each organization and client. Moreover, client may use the existing infrastructure to adopt this service. The software of iSIEMS and SIRS are free to use currently. The list price of subscription of Elasticsearch from Elastic’s sales channel is USD 11,000 per node (The price queried on April 2019). The total nodes of Elasticsearch are depended on the requirement of daily log size. The price is needed to be further discussed according the details requirements of client. The price is needed to be further discussed according the details requirements of client, there are limited service tickets included for further development of security engineering and new enhancement item.